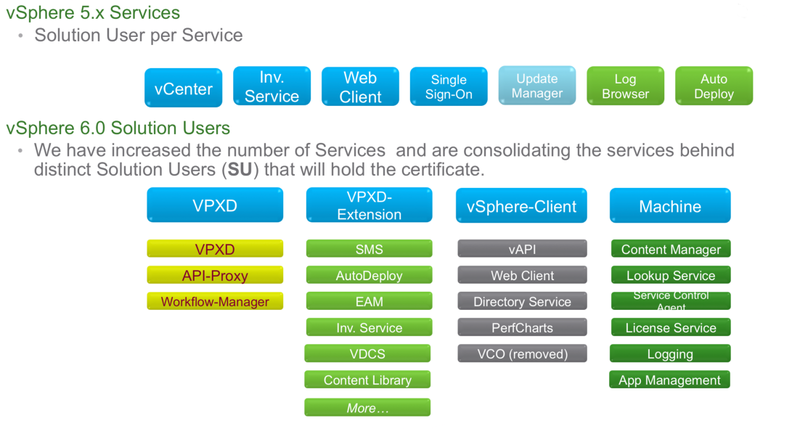 One of the nicest improvements in vSphere 6 is the ability to use the VMware Certificate Authority (VMCA) as a subordinate CA. In most cases enterprises already have some form of PKI deployed in house and very often it is Microsoft based so I will show you how I did it with a Microsoft Enterprise CA. I give for granted that the Microsoft PKI is already in place, in my case it is a single VM with an Enterprise Microsoft CA installed. The vCSA should also be already be in place. Compile the config file with the parameters that are good for your setup then save the file and exit. Now you have to take the crt file in base64 format on the vCSA and also the Microsoft CA root certificate in base64 format as well; copying files with SCP will be a challenge because the root user on the vCSA by default doesn’t use the bash shell so if you want to use this method you need to edit the “/etc/passwd” and set the root user to use bash as a shell and then you can put it back as it was once you are done transferring the files. 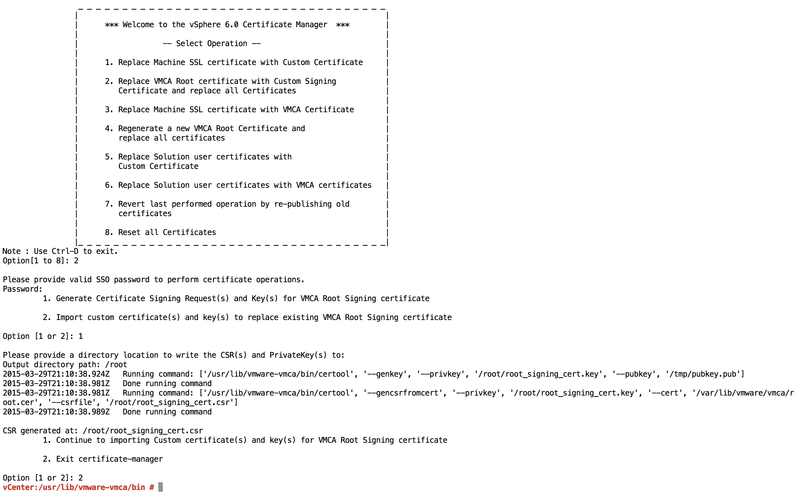 It could be just simpler to open the certs on your computer and the connect to the vCSA via SSH and copy the content inside new files; one way or another you need to take the certificates on the vCSA, in my case they are “root_signing_cert.pem” and “cam.pem”. If you open the “caroot.pem” file you should see a single cert file with both ca and certificate one after another. As you can see now this is a trusted connection and the VMCA has released certificates for the Solution Users on behalf of the Microsoft Root CA. In case you decide to remove the original root certificate then you will have to refresh the Security Token Service (STS) Root Certificate, and replace the VMware Directory Service Certificate following the vSphere 6 documentation. Now the VMCA is capable of signing certificates that are valid in you PKI chain and are trusted by default in you Windows domain by all clients. For HA scenario if you install PSC on separate boxes you will still need a load balancer. Supported solutions are Big-IP F5 and NetScaler so far. Virtual Datacenter Service: this service is new and it has been introduced to help mitigate the limitation connected with the Datacenter object in vCenter as a Management boundary. Since VMCA and VECS are part of the PSC, they will take advantage of the Multi-Master Replication Model which is offered by the Directory Service (VMDir) in order to achieve HA. In the past every service had its own user and required its own certificate but this is not the case anymore since we now have Solution Users (SU); since the number of services has increased significantly it would be impractical to manage the lifecycle of this many certificates so now we have 4 main SU that will hold the certificate used for a number of services. What about use cases/scenarios in which I can implement VMCA? In what ways you can use this new tool? Scenario 1 and 2 are similar: the VMCA is the CA that releases certificates for all Solution Users (SU), the only difference is that in scenario 1 the VMCA is the root CA and you will need to distribute the Root CA Certificate so that all corporate browsers will trust it, while in scenario 2 the VMCA becomes part of an existing PKI as a subordinate CA and you certificate trust. In scenario 3 VMCA is installed but not used, CSRs are created and submitted to an external CA and VECS will be used to store certificates in PEM format. My favorite is scenario 2 because most enterprises I see already have a PKI (Microsoft CA usually) and all clients already trust the CA certificates, so adding the VMCA as s subordinate is a non disruptive process with a very low maintenance impact on the PKI itself, it protects investments already made to implement the current PKI and preserves the knowledge to run the PKI. 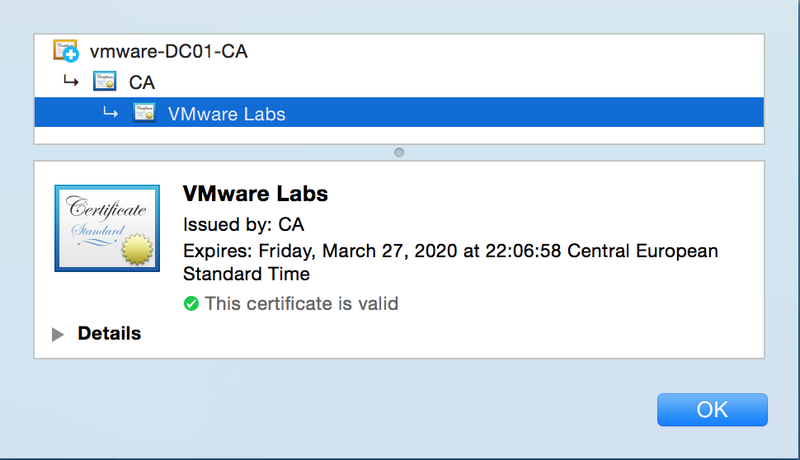 Replacing certificates is still a CLI task (looks like Powershell will be involved) but VMCA and VECS are a very promising step toward the right direction for simplifying certificate lifecycle management in a vSphere environment. DISCLAIMER: This is a very lenghty procedure and I’ve changed some steps from the original KB trying to make it shorter; if I made some mistakes please let me know. I don’t do this all the time but today I had to replace SSL certificates on a vCenter Virtual Appliance and since I know this will happen more and more often I thought I should write a shorter procedure since VMware KB is very detailed and, yet again, very long. At least it’s not as long as the infamous 96 steps of version 5.1. Before proceding it’s good practice to shutdown your vCSA and take a snapshot. Also, since we are going to use a Microsoft CA for this tutorial, it would be a good idea to take a look at KB2062108 and complete those steps before proceeding. Note: This procedure is specific for vCSA 5.5. If you have a previous version of vCSA please refer to KB2036744. Download and install the latest build of OpenSSL 0.9.8 on a machine of your choice. For convenience I installed it on a Windows VM in “C:\OpenSSL”. Save the file as “C:\OpenSSL\Certs\openssl_generic.cfg”. You should now have a .cfg file for each service in each folder with a different organizationalUnitName. To generate the certificate requests, assuming you have the same path I have, you can use the following commands. Now you should also have a .key file and a .csr file in each respective directory. Click the Request a certificate link. Click the Submit a certificate request by using a base-64-encoded CMC or PKCS #10 file, or submit a renewal request by using a base-64-encoded PKCS #7 file link. Open the certificate request (rui_service.csr, as generated above for each component) in a plain text editor and paste this text into the Saved Request box. 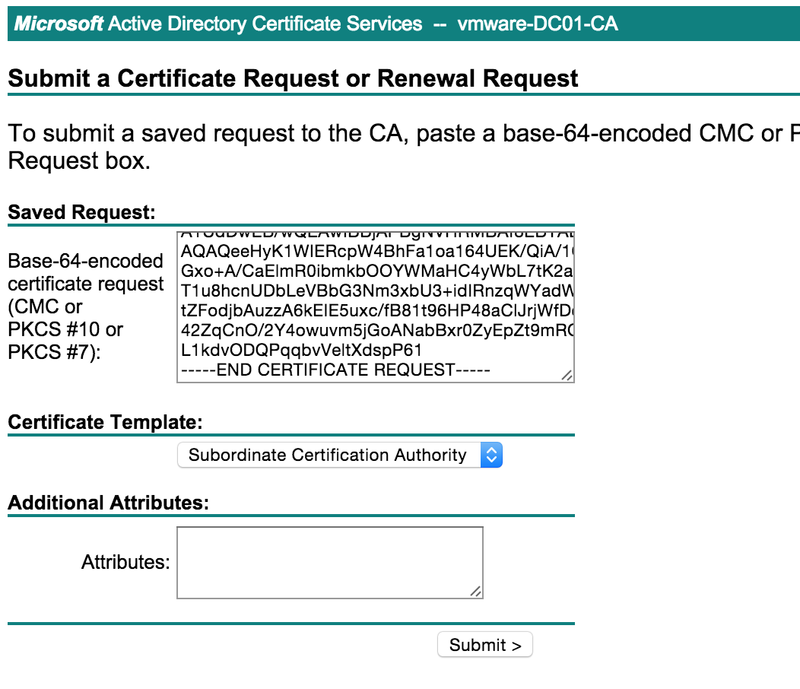 Select the Certificate Template as VMware Certificate. Click Submit to submit the request. Click Base 64 encoded on the Certificate issued screen. Click the Download Certificate link. Repeat Steps 2 to 10 for each of the additional service. Navigate back to the home page of the certificate server and click Download a CA certificate, certificate chain or CRL. Click the Base 64 option. Click the Download CA Certificate chain link. Save the certificate chain as cachain.p7b in the c:\openssl\certs\ directory. By default, Microsoft CA certificates are generated with the .cer format. Either use Save As or change it to .crt before continuing. When complete, you have four certificates (rui_service.crt) for each of the services generated in their respective c:\openssl\certs\<services> folders and the cachain.p7b file in the c:\openssl\certs\ folder. Rename all files in the service folders so that the .key file is named “rui.key” and the .crt file is named “rui.crt”. Now open cachain.pem with a text editor and remove any text before the first “—–BEGIN CERTIFICATE—–” and after “—–END CERTIFICATE—–“. Note: This assumes there are no intermediate certificates in the Certificate Authority. Copy the cachain.pem file in every service folder. Check KB2057248 if you get a different result. Note: As there is a plain-text password on the above command, to avoid the history file showing the contents of the password because it is in plain text in the command above, run the unset HISTFILE command prior to executing any step containing a password. You can now restart the vCenter Server Appliance and chek that the certificates have been successfully replaced. When working with Horizon Workspace the first component you will scale to multiple instances is probably the gateway-va since this is the access point of all users, just to make sure it’s always available for connections. In this case you need a load balancer to direct all users to all the gateway-va you have in your environment; i wrote about commercial and open source load balancers and also how to build one with HAProxy in this post. I’m going to show you how i configure it with Horizon Workspace but remember that since I’ve learned about HAProxy only relatively recently by Luca Dell’Oca my configuration is just the way i do it and not necessarily the best so use the comments if you want to contribute. Try to add a gateway-va and experiment with HAProxy to test HAProxy as load balancer. You can use this article if you want to know how to do it. UPDATE: If you are deploying Horizon Workspace 1.5 you should look at this post. In the last post we generated new certificates from an internal Microsoft CA to use them as replacement of the Horizon Workspace self-signed certificates that are created during the setup process. For certificates to work correctly, all parties in the process need to trust the Certification Authority; this include all servers and clients involved in the Horizon Workspace deployment. Because of this, before applying the new certificates to Workspace virtual appliances we need to add our internal Microsoft CA to the list of trusted Certification Authorities; this step is not needed if you are buying certificates from a public CA that is already trusted, Verisign can be an example. Note: The password to import the CA in the store is “changeit”. Note: If you have an intermediate CA certificate you will have to run the same commands for that certificate too. At this point your internal CA should be trusted but at times I’ve seen this happening only after a reboot of all virtual machines, so let’s just stop the vApp and restart it. You will get a green box as a confirmation. Well that’s great, isn’t it? There’s still a lot of work to do to complete our environment but are well on our way. More in the posts to come, see you there! During installation of Horizon Workspace in the last post we used self-signed certificates for simplicity but when you will put Workspace in production you will definitely want to replace those certificates. In this post we will use an internal Microsoft CA to request certificates for our Horizon Workspace implementation. Note: The installation of a Microsoft CA is outside the scope of this article. If you connect to your Horizon Workspace FQDN you will see the classic browser warning when you connect to an SSL website which certificate has been released by a Certificate Authority you don’t trust. You can see how we don’t trust the CA as it is stated in red and as you can see from the certificate tree at the top. We need to create a certificate request to pass to our Microsoft CA so that it can process it and spit out a certificate for us. There are several tools to create certificate requests but i like to use OpenSSL because it is available on almost every operating system so if you learn how to do it from that you will be able to do it in most situations. The steps i am going to take will work on every platform, regardless the fact that i will do this on a Mac you will be able to take the same steps on a Windows box. You can find OpenSSL binaries for Windows here. The first command will generate a private key (key.pem) that we will use for our request, the second command will actually create a request file signed it with the private key we just created. Note: The common name value is what your browser checks to be the same of the website you are trying to access, if different it will throw an error. You should get a file called “certnew.cer” that i normally rename in “horizon.pem”. Select “Base 64” and then “Download CA certificate”. Whenever you download a certificate from a Microsoft CA it will be called “certnew.cer” so you can see why it’s a best practice to rename them, i usually call this “ca.pem”. Every guide you will find out there that instructs you how to generate certificates will most of the time do a bad job explaining the various kind of formats, the difference between them and when to use one kind or another. Since i don’t want to take credit for something i didn’t do i want you to know that the following is taken from this webpage where you will also be able to convert different types of certificates if you need. When you are dealing with certificates you will find different formats such as pem, der, p7b, and pfx. A Windows server for example exports and imports .pfx files while an Apache server uses individual PEM (.crt, .cer) files. The following is a definition of the various formats i mentioned. The PEM format is the most common format that Certificate Authorities issue certificates in. PEM certificates usually have extensions such as .pem, .crt, .cer, and .key. They are Base64 encoded ASCII files and contain “—–BEGIN CERTIFICATE—–” and “—–END CERTIFICATE—–” statements. Server certificates, intermediate certificates, and private keys can all be put into the PEM format. Apache and other similar servers use PEM format certificates. Several PEM certificates, and even the private key, can be included in one file, one below the other, but most platforms, such as Apache, expect the certificates and private key to be in separate files. The DER format is simply a binary form of a certificate instead of the ASCII PEM format. It sometimes has a file extension of .der but it often has a file extension of .cer so the only way to tell the difference between a DER .cer file and a PEM .cer file is to open it in a text editor and look for the BEGIN/END statements. All types of certificates and private keys can be encoded in DER format. DER is typically used with Java platforms. The PKCS#7 or P7B format is usually stored in Base64 ASCII format and has a file extension of .p7b or .p7c. P7B certificates contain “—–BEGIN PKCS7—–” and “—–END PKCS7—–” statements. A P7B file only contains certificates and chain certificates, not the private key. Several platforms support P7B files including Microsoft Windows and Java Tomcat. The PKCS#12 or PFX format is a binary format for storing the server certificate, any intermediate certificates, and the private key in one encryptable file. PFX files usually have extensions such as .pfx and .p12. PFX files are typically used on Windows machines to import and export certificates and private keys. Pluralsight Free Trial Click Here! Are you starting or advancing your career in IT?